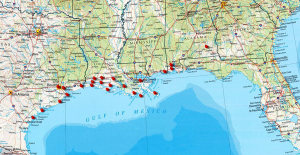 Martin Energy Services offers 24/7/365 terminal services at 30 facilities across the Gulf of Mexico. Our vast number of locations will ensure that your company’s requirements are met in the most timely, cost-effective, safe and environmentally friendly manner possible throughout this region. We are committed to providing our valued customers with a “one-stop-shop” atmosphere. This efficiency enables us to provide overall cost savings and a drastic reduction in scheduling delays. All MES terminals provide quality fuel, a complementary line of major brand lubricants and potable water supply.